Peter Carl Faberge was a Russian jeweler who is famous for the legendary series of Russian Imperial Eggs created between 1885 and 1917 for Tsar Alexander III and later his son Nicholas II. These eggs were lavish and intricate art pieces made of precious metals, painted with an enamel process and decorated with gem stones. 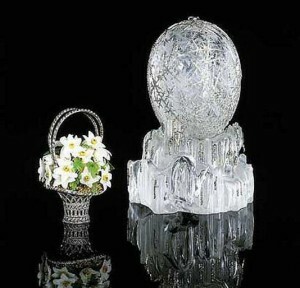 They have become a symbol of the Russian Imperial family and are considered the masterpieces of House of Faberge. Easter is an important celebration in the Russian Orthodox Church. Over the years a tradition of bringing hand-colored eggs to the Church to be blessed then later given as presents to family and friends. 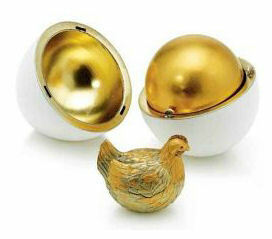 For the wealthy members of Russian society the custom developed into giving more expensive jeweled eggs. 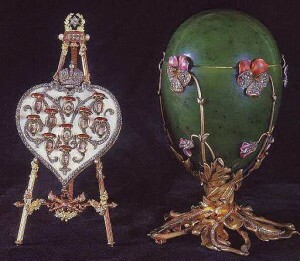 Faberge had been creating miniature jeweled eggs to be worn as jewelry for several years. 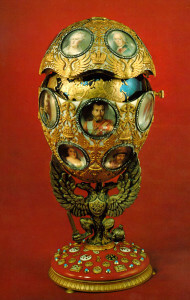 The first Imperial Faberge egg was commissioned by Tsar Alexander III as a gift for his wife, Empress Maria Fedorovna. Inspired by an egg owned by the Empress’s aunt, Princess Wilhelmina Marie of Denmark, during her childhood the Empress was known to have greatly admired this egg. 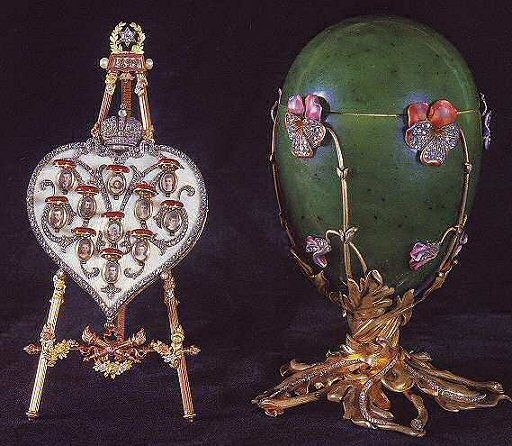 The Tsar wanted to give an Easter egg in a similar style as a romantic gift to the Empress to commemorate the 20th anniversary of their betrothal. 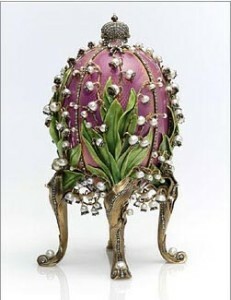 When this first egg proved to be a success with the Empress, the Tsar commissioned Faberge to create additional Imperial Easter Eggs every year with the only requirement being that each would contain a hidden surprise. Once Faberge was appointed the goldsmith to the Imperial Crown, he was given complete creative freedom and his designs became more elaborate and intricate. When Alexander III died in 1894, his son Nicholas II, continued the family tradition and presented a Faberge egg to both his wife, Empress Alexandra and his mother, now Dowager Empress Maria, every year until 1916. Each Faberge Imperial Egg, from conceptual drawing to complex production by a team of highly skilled craftsmen, could take over a year to complete. Faberge designed his eggs to commemorate the milestones and achievements of the Russian Imperial court and also to reflect the personal events of the Romanov dynasty. Such as, the 1911 Fifteenth Anniversary Egg that commemorated Nicholas II accession to the throne or the 1913 Romanov Tercentenary Egg which celebrated the 300 years of the Romanov dynasty which included portrait miniatures of the Russian rulers. Throughout the years the element of the hidden surprises remained a constant feature of the Faberge Eggs. 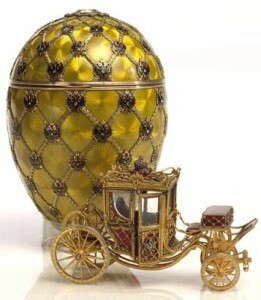 Such as the 1897 Coronation Egg with a miniature replica of the Coronation carriage that took over 15 months to complete or the 1899 Pansy Egg which included a small heart shape medallion with miniature portraits of the Imperial family. Only one of the Imperial Eggs, the 1916 Order of St. George, left Russia with the original owner, The Dowager Empress Maria. Following the Russian Revolution, the Romanov palaces were ransacked by the Bolsheviks and by order of Vladimir Lenin the contents, including the Imperial Eggs, were moved to the Kremlin Armory. Later in 1927, Joseph Stalin sold several of the eggs in order to obtain foreign revenue. Then, between 1930 and 1933 an additional 14 Imperial Eggs were sold, some were purchased by Armand Hammer, the owner of Occidental Petroleum. Malcolm Forbes, the publisher, owned nine Imperial Eggs and approximately 180 other Faberge items. After his death in 1990, the entire collection was scheduled for sell at Sotheby’s in New York City in 2004, but before the auction started someone purchased them for the amount estimated between $90–120 million. Currently, it is believed that of the 50 original Russian Imperial Eggs only 44 are known to still exist. If you are interested in further information on the Russian Imperial Eggs, I would recommend the book, “Faberge’s Eggs: The Extraordinary Story of the Masterpieces That Outlived an Empire” by Toby Faber. I also recommend the DVD, “Treasures – The Czar’s Faberge Eggs”, a 2005 A&E documentary. For a great craft idea, please check out Faberge-inpried Eggs for a list of supplies and instructions. This entry was posted in Decor and tagged Barbara Jones, Decor, Enchanted Manor, Faberge Eggs, Peter Carl Faberge, Russian Imperial Eggs, The Enchanted Manor by barbara. Bookmark the permalink.